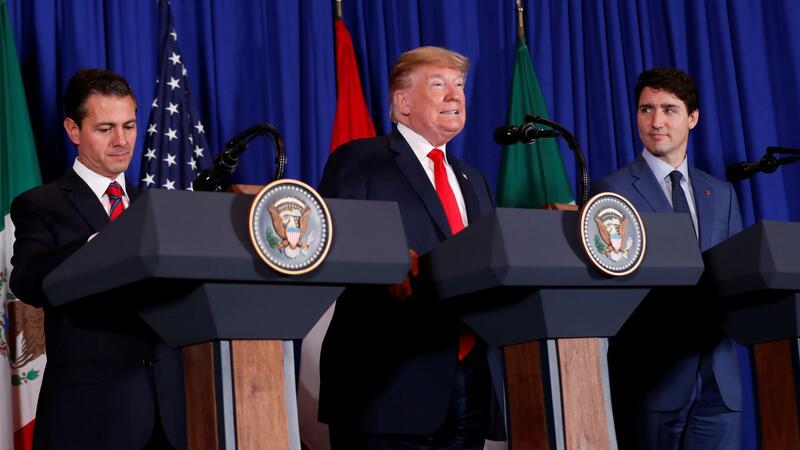 President Donald Trump signed the USMCA trade deal on Friday, alongside Canada's Prime Minister Justin Trudeau and Mexico's President Enrique Peña Nieto in Buenos Aires. "Let's go," all three leaders said as they sat alongside each other to sign multiple copies of the deal. They then shuffled binders around in front of them, to finalize the deal that remakes one of the world's largest free trade zones. When the signing was over, they paused for a photo-op. "Might as well hold that up," Trump said, displaying the fresh signatures as the three leaders sat together. The signing event and the leaders' remarks were livestreamed. You can watch the event here. In the lead-up to the signing, Canadian officials had "made it clear they didn't want to celebrate the end of a year of U.S. attempts to twist Canada's arm with the tariffs still in place," the CBC reports. But that wish ran counter to the desires of Trump and Peña Nieto, both of whom have preferred to portray the deal as a victory that helps to cement their legacies. "This has been a battle, and battles sometimes make great friendships," Trump said at the start of the signing ceremony. Saying all three countries will benefit from the deal, Trump said of the USMCA, "It is probably the largest trade deal ever made." The USMCA (read the whole text here) replaces the North American Free Trade Agreement, which had created a free trade zone between the three countries back in 1994. The deal will require ratification by all three countries' legislatures before taking effect. "The biggest change this deal makes, really, is to the automotive sector," NPR's Scott Horsley reports, "where it does put higher requirements on North American content, and in particular high-wage content, for vehicles to trade duty-free." Calling the deal "the new North American Free Trade Agreement, Trudeau said it "lifts the risk of serious economic uncertainty that lingers throughout a trade renegotiation process — uncertainty that would have only gotten worse and more damaging if we had not reached a new NAFTA." There is more work to be done, Trudeau said, calling the recent announcement that General Motors will close plants in Canada and the U.S. "a heavy blow." Turning to address Trump, said "And Donald, it's all the more reason why we need to keep working to remove the tariffs on steel and aluminum between our countries." "General Motors has said that those steel and aluminum tariffs robbed it of a billion dollars in profits in the last year," Scott Horsley reports. In June, GM also warned the Trump administration that new tariffs could result in "a smaller GM." "In fact, one-third of the agreement includes topics that were not included in the first agreement," he said. Peña Nieto also said the USMCA "is the first trade agreement that incorporates elements that address the social impact of international trade; it enables the participation of more sectors in the economy." Among those provisions, he said, are protections for workers' rights and the environment, and elements that seek to extend the benefits of free trade more broadly. The signing took place on Peña Nieto's final day in office; Mexico's newly elected president, Andrés Manuel López Obrador, will be sworn in on Saturday. The move "shocked many in Mexico," as NPR's Carrie Kahn reported earlier this week, referring to the outrage and anger that has poured out online.